There were two matches played today. In the first match, favorites Sunrisers Hyderabad defeated rain to finally win after batting 5 overs. Delhi Daredevils was never in contention to win, before or during the match. While they lost their 4th consecutive match at home, making it a habit, Mumbai Indians lost their first match at home ending their 10 match winning streak at home. But were they ever considered favorite against Chennai Super Kings, in their current forgettable season, away or at home!! Before the rain curtailed Sunrisers Hyderabad’s chase, Steyn, as usual dented Delhi Daredevils hope, and as a result he finally earned his first such award of current season. Dwayn Smith grabbed his third Player of the Match award of the season. Earlier he had received the award for his other 50s against DD and Sunrisers. Sandeep Sharma of Kings XI has also won three player of the match awards, while Maxwell of Punjab leads the list with four such awards already in 2014. Delhi Daredevils had a different game plan as Captain Pietersen attacked from the first ball. Running between the wicket was sharp by almost all. As a result initially they challenged the SRH bowling, and scored 52/1 in 6 overs. But, Amit Mishra was again successful at his home zone, Delhi sending Pietersen and Mayank Agarwal in consecutive overs, 7th and 9th. DD completed 100 runs in 12.5 overs. Rain interrupted first time when they had played 13.1 overs. But in their 20 overs they could manage only 43 more runs. 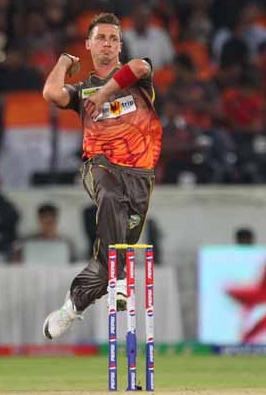 Steyn (2/20), Amit Mishra (2/23), B Kumar (1/23) were the regular tormentors. Henriques was expensive but successful with 2/26 in 3 overs. Karn Sharma (0/29) faced the brunt of bat. Chasing was disrupted and after long delay, SRH had to score 43 runs in 5 overs, which they achieved in 4.2 overs. Openers Dhawan and Finch could score 4 runs each only. Warner (12 in 9 balls) and Naman Ojha (13 runs in 3 balls) got them to the 4th position in Points Tally. Electing to field, CSK bowlers tighetened their noose over MI batsmen. Simmons (run-a-ball 38 runs), Gautam (8-ball 9 runs), Rohit Sharma (run-a-ball 19 runs) could not do much. Even Rayudu (43-ball 59 runs with 4 sixes) was scoring almost run-a-ball before in the end he realized the overs are just about to finish. As a result in 17 overs despite losing only 2 wickets, MI has scored not even 120 runs. In the remaining 3 overs they lost 4 wickets but managed to score 37 runs and reach decent 157 runs, as Rayudu accelerated and finally Pollard (first-ball duck), Anderson (6-ball 18* runs) and Tare (5-ball 9 runs) could get their chance. For CSK Mohit Sharma (1/26) was the most economical, Ashwin (3/30) was the most successful, while Badree and Ishwar Pandey (1/34 each), and Jadeja (0/33) were expensive. CSK owed lot of runs to their surprising misfieldings. Chasing the target Brendum McCullum (11-balll 13) and Raina (11-ball 19) failed. But Faf du Plessis (24-ball 31) and Dwayn Smith (51-ball 57 runs) got them closer. In the last two overs they needed 16 runs. 19th over bowled by Malinga got them only 5 runs and they lost Jadeja and Manhas. But Pollard bowling the last over to save 11 runs was visibly nervous against Dhoni (12-ball 22* runs) and CSK won with 3 balls remaining.